﻿Published by Sareth Ney on Nov. 30, 2017 at 11:08 p.m.
ORLANDO, Fla. – Platinum Comedy Tour is coming to the CFE Arena, on Feb. 16. The lineup includes Mike Epps, DeRay Davis, Sommore and Earthquake. Epps was part of the Def Comedy Jam tour and appeared on HBO’s Def Comedy Jam. His comedy special, “Inappropriate Behavior”, was aired on HBO and hosted Def Comedy Jam, in 2006. Some films Epps could be seen include: “All About The Benjamins”, “Next Friday”, “Friday After Next”, “Roll Bounce”, “Something New”, “Guess Who”, “The Honeymooners”, “Welcome Home Roscoe Jenkins”, “The Grand”, “Soul Men”, “Hancock”, “Open Season 2”, “Next Day Air”, “Resident Evil: Extinction”, “Bait”, “How High”, “Talk To Me” and provided voiceover work for “Dr. Dolittle 2”. “Barbershop”, “My Wife and Kids”, “Barbershop 2: Back in Business”, “Johnson Family Vacation”, “Entourage”, “The Fog”, “Scary Movie 4”, “Reno 911!”, “Semi-Pro”, “The Boondocks”, “21 Jump Street” (2012), “Black Dynamite”, “G.I. Joe: Retaliation”, “Empire” and “Barbershop: The Next Cut” were some of Davis’ acting credits. As a writer and producer—Davis wrote and executively produced two comedy specials, “Power Play” and “How to Act Black”. He wrote one episode each of “Comedy Central Presents” and “Laffapalooza”. He wrote two episodes of HBO’s “Def Comedy Jam” and BET’s Comicview”. Few of Sommore’s appearances in film and television include: BET’s “Comic View”, “Def Comedy Jam”, “Showtime at the Apollo”, “Politically Incorrect with Bill Maher”, “Special Women in Comedy”, “The Hughleys”, “The Parkers”, “SNAPS”, “Wild ‘N Out”, “Celebrity Fit Club”, Comedy Central’s “Roast of Flavor Flav”, Comedy Central’s “The Queen Stands Alone”, “Queens of Comedy”, “Friday After Next”, and “Soul Plane”. Awards and accolades for Sommore include receiving the Richard Pryor Award for Comedian of the Year in 1995 and is part of the Guinness’ Book of World Records. Earthquake was part of nine comedy specials: “Def Comedy Jam”, “These Ain’t Jokes”, “From The Outhouse to the White House”, “Platinum Comedy Series: Earthquake”, HBO’s “One Night Stand”, BET’s Comic View All Stars 8”, “Latham Entertainment Presents”, “Shaquille O’Neal presents All Star Comedy Jam” and “Jamie Foxx presents Laffapalooza! Live from Hotlanta 5”. ​Select film and television works of Earthquake’s include: “Clerks II”, “The Longshots”, ”Everybody Hates Chris”, voiceover on “Barnyard”, “Getting Played” and “Something Like A Business”. He was part of “Comedy Central Presents” and “Premium Blend”. 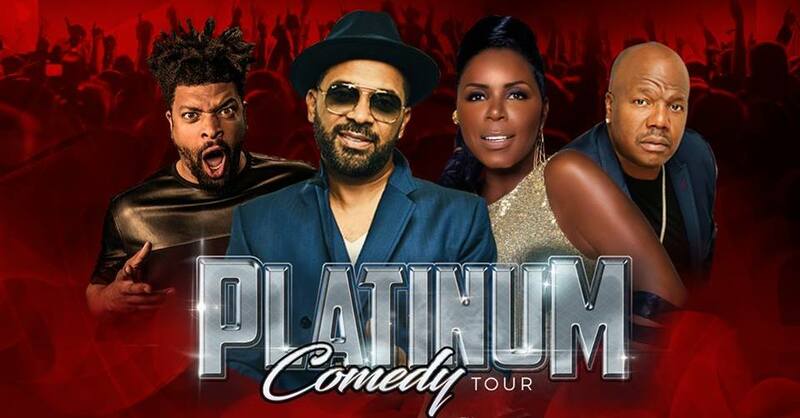 Tickets to attend the Platinum Comedy Tour at CFE Arena range from $52 to $125. They exclude fees and lineup is subject to change. Dec. 1 - Tommy T’s Comedy Club, Rancho Cordova, Calif.
Dec. 2 - Tommy T’s Comedy Club, Rancho Cordova, Calif.
Dec. 3 - Tommy T’s Comedy Club, Rancho Cordova, Calif.
Dec. 8 - Pittsburgh Improv, Homestead, Pa.
Dec. 9 - Pittsburgh Improv, Homestead, Pa.
Dec. 10 - Pittsburgh Improv, Homestead, Pa.
Dec. 22 - Ontario Improv, Ontario, Calif.
Dec. 23 - Ontario Improv, Ontario, Calif.
Dec. 30 - Mobile Civic Center, Mobile, Ala.
Jan. 5 - Comedy Off Broadway, Lexington, Ky.
Jan. 6 - Comedy Off Broadway, Lexington, Ky.
Jan. 7 - Comedy Off Broadway, Lexington, Ky.
Feb. 14 - Bon Secours Wellness Arena, Greenville, S.C.
Feb. 16 - CFE Arena, Orlando, Fla.
Feb. 17 - USF Sun Dome, Tampa, Fla.
Feb. 18 - Metro Nashville Municipal Auditorium, Nashville, Tenn.
Feb. 23 - Shreveport Municipal Auditorium, Shreveport, La. March 10 - KFC Yum! Center, Louisville, Ky.
Dec. 1 - Tampa Improv, Tampa, Fla.
Dec. 2 - Tampa Improv, Tampa, Fla.
Dec. 3 - Tampa Improv, Tampa, Fla.
Dec. 1 - Comedy House, Columbia, S.C.
Dec. 2 - Comedy House, Columbia, S.C.
Dec. 3 - Comedy House, Columbia, S.C.
Dec. 8 - Orlando Improv, Orlando, Fla.
Dec. 9 - Orlando Improv, Orlando, Fla.
Dec. 10 - Tampa Improv, Orlando, Fla.
Dec. 21 - Tampa Improv, Tampa, Fla.
Dec. 22 - Tampa Improv, Tampa, Fla.
Dec. 23 - Tampa Improv, Tampa, Fla.